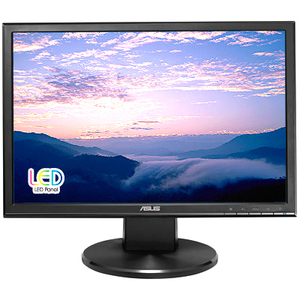 The ASUS VW199T-P 19" Widescreen LED LCD Monitor provides excellent visual performance. Indulge your visual senses with 1440 x 900 resolution and 5ms quick response time for work and entertainment. The best dual-display companion with your widescreen notebook enlarges the visual space for multi-tasking efficiency. Aspect control function allows users to select a preferred display mode among Full and 4:3 for true-to-life gaming or movie watching without any data loss or image distortion. Product Description: ASUS VW199T-P, LCD display, TFT, 19"